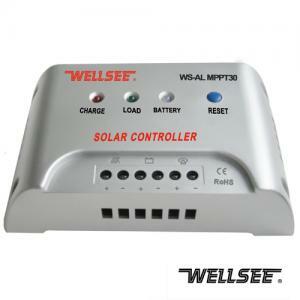 WELLSEE Lighting Control WS-ALMPPT30 12/24V 25A_Lighting Controller_Products_solar controller,charge controller,solar regulator,lighting controller,mppt controller are selling best on our website! This new WELLSEEE lighting control WS-AL MPPT30 controlled solar lighting charge controller will eliminate the need for seperate charge controller, timer ,light-dimmer and light control in a 12/24v, and 48V lighting system. It uses the photovoltaic array to detect day and night and will learn the length of your night in order to provide light before sunrise. Savebattery and array size by setting the light to turn off in the middle of the night. Maximum power point tracking is a technique thatsolar inverters use to get the most possible power from the PV array. Any given PV module or string of modules will have a maximum power point: essentially, this defines current that the inverter should draw from the PV in order to get the most possible power (power is equal to voltage times current). l One piece of Load Indicator LED (mark: load). When it is bright, there is output and load can work; if LED goes out, means there isn’t output and the load cannot work. Please send price and specfication on ALL LCD charge controller.